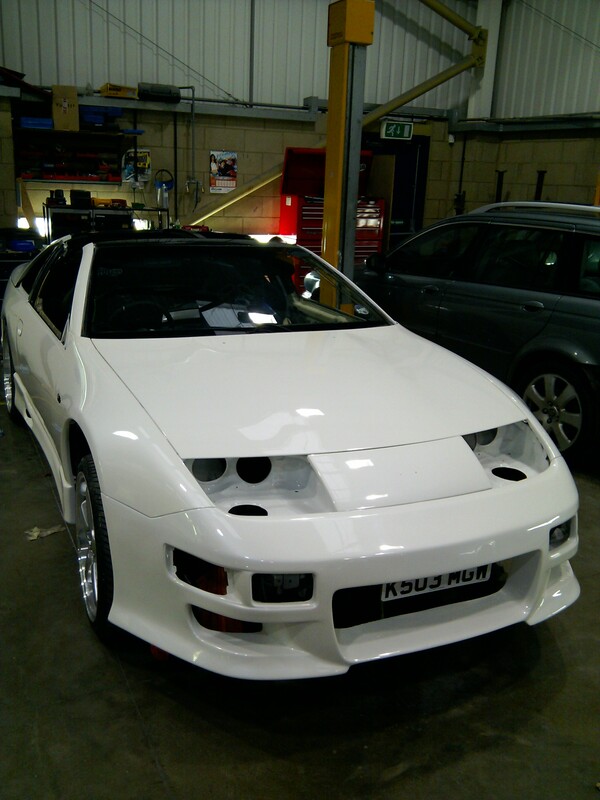 The fastest Nissan 300ZX TT in Europe in the making! 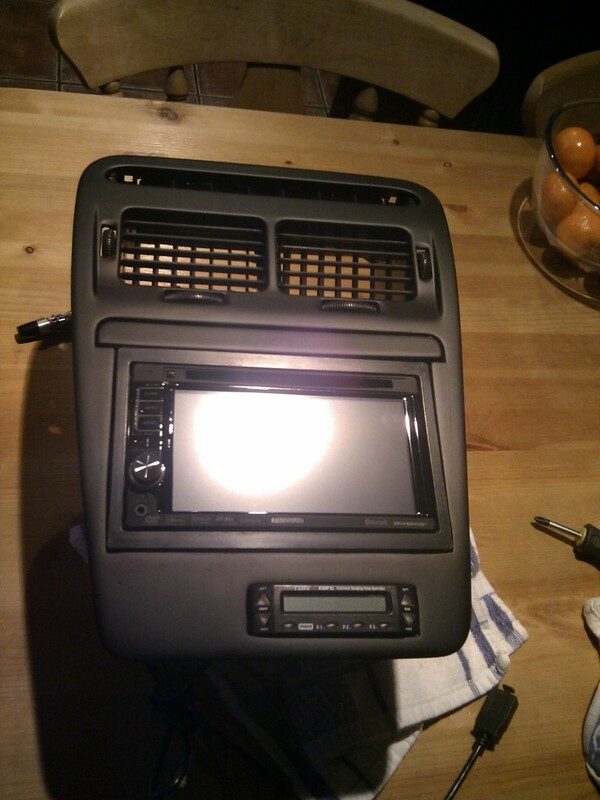 For the Audio we wanted to install a double din stereo and sat nav system. I wanted it to be a flush mount and to look like it has always been there. If you want to do this I have listed the instructions for doing it here. 1. 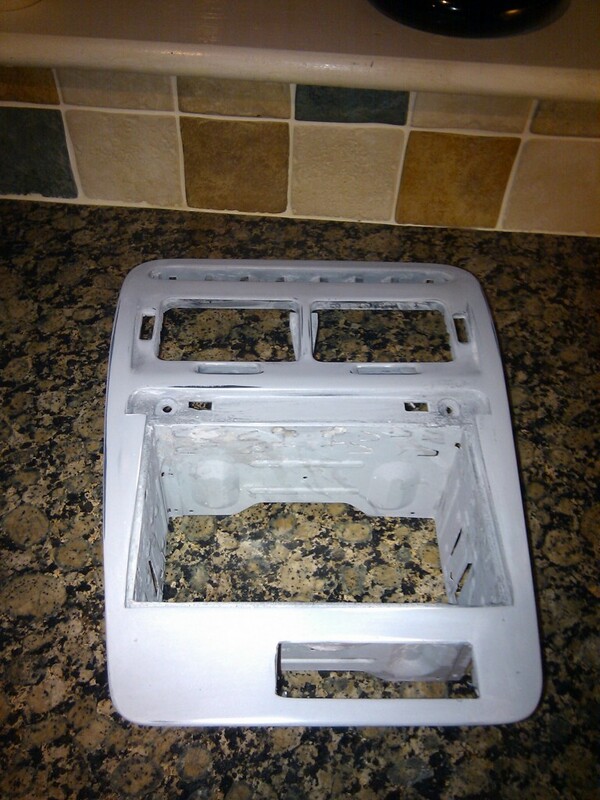 Remove the metal retaining bracket from the centre console there are only about four screws to do this. Then remove the two retaining screws on clips at the bottom, and then remove the fan direction assembly. 2. Take a junior hacksaw or saw of some kind and roughly cut out the centre shelf, it does not have to be tidy but just enough so the metal stereo securing bracket will slide in the hole. 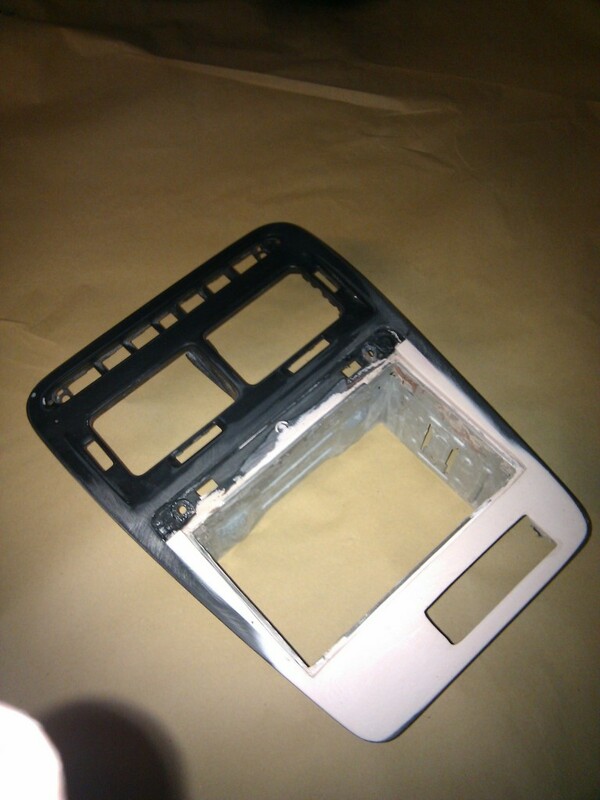 3. insert the metal securing bracket into the hole in the centre console. 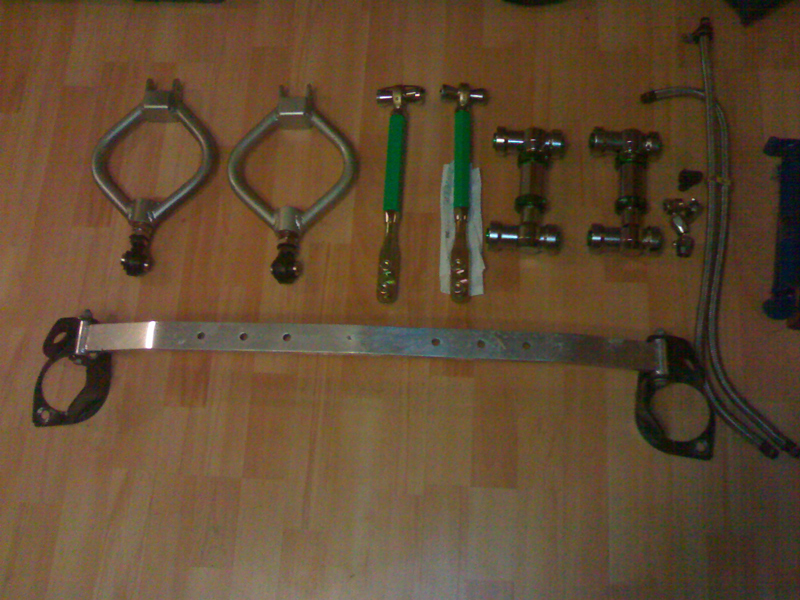 You will notice that the hole is now far wider in a lot of places than the metal securing bracket. 4. now clip the stereo surround onto the securing bracket to get a rough idea of depth if you want a flush fit. 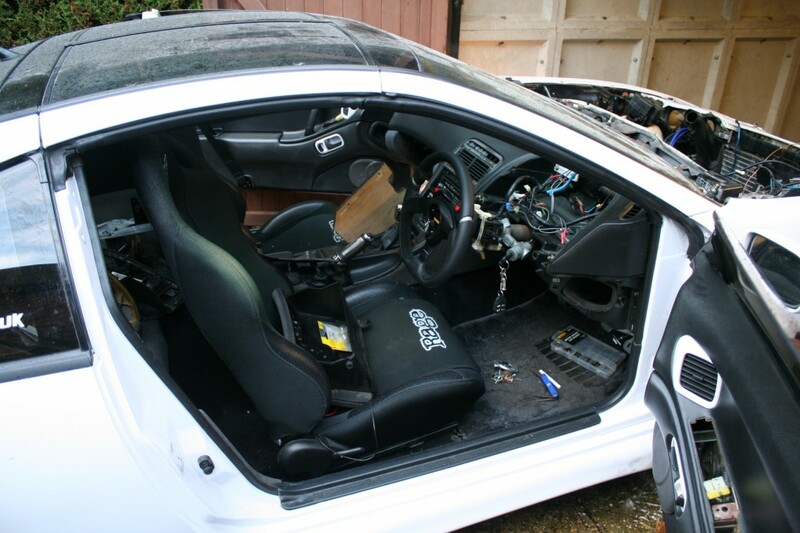 Remove it so you dont get fiberglass all over it. Then while trying to maintain the position and depth use a screwdriver and push out some of the securing fixings into the centre surround cavity to hold it in place, you can support it if neccesary. 5. 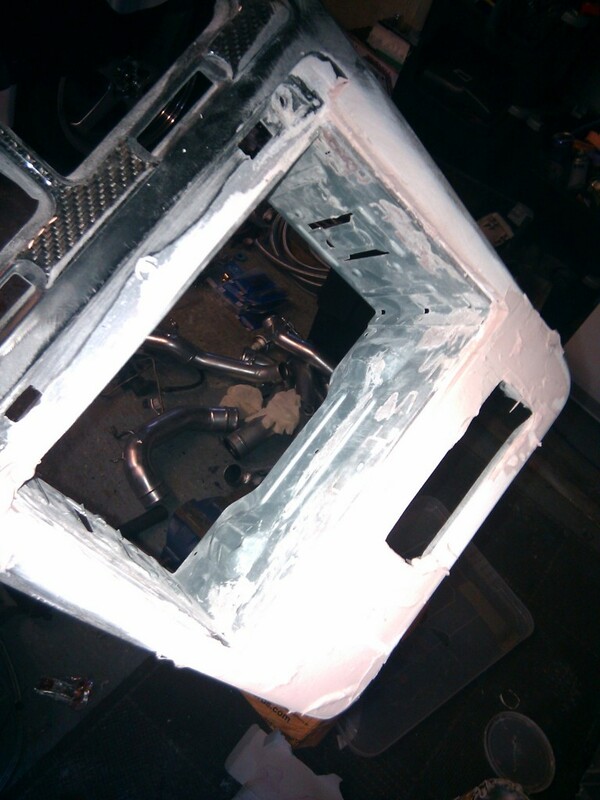 Now mix up some fiberglass and fiberglass all sides of the securing bracket into the facia hole, dont build it to high as remember this is to support the bracket in the hole but not give the final finnish. If you end up putting to much on you will need to sand it back!. It will naturally go through the securing bracket holes, simply use the plectrum that you applied it with to ensure it does not go into the inside of the bracket to far. 6. 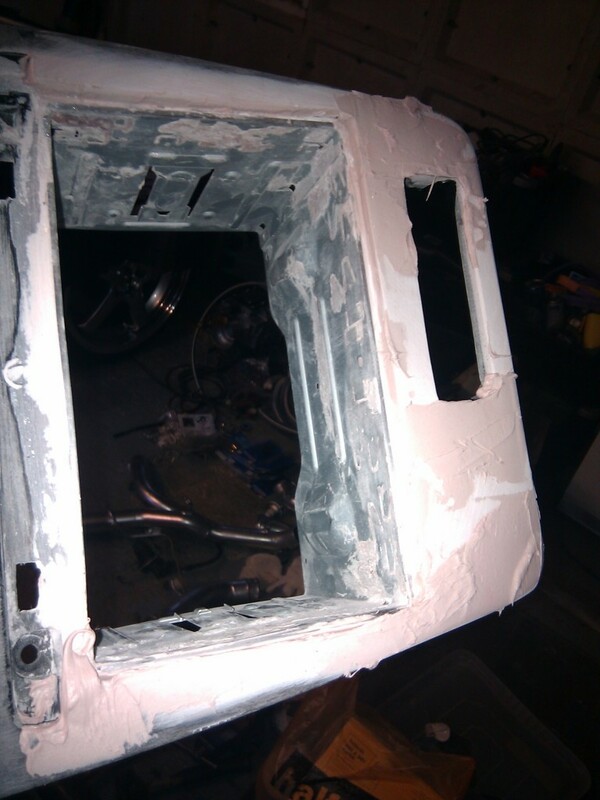 After the fiberglass is dry it will form a very very strong bond between the securing bracket and the centre console, use some 80 grit to rub any excess off from the inside of the bracket and from the front of the facia before you fill it. 7. Now this part is important to save hours of needless sanding to get a good fit! 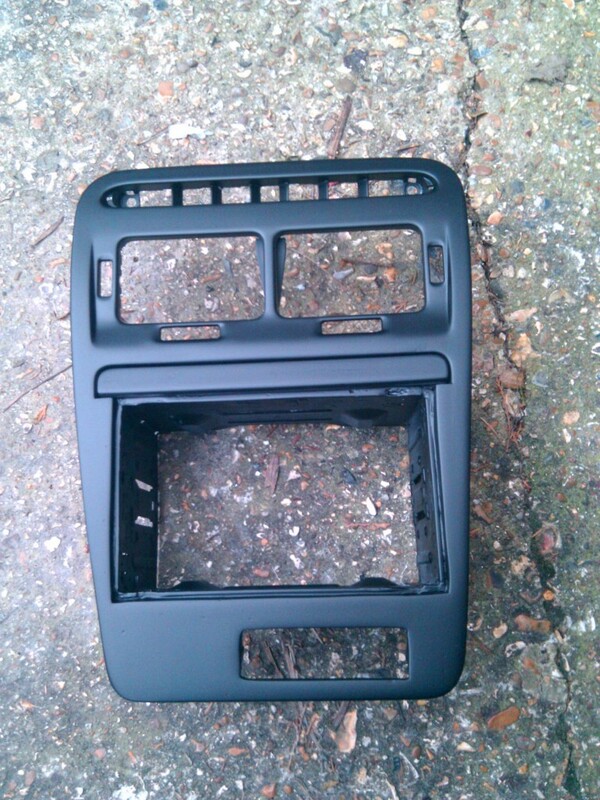 mask up completely the plastic surround bracket that goes around the stereo. Insert it into the secring bracket masked up. You can use this as a guide to fill against. 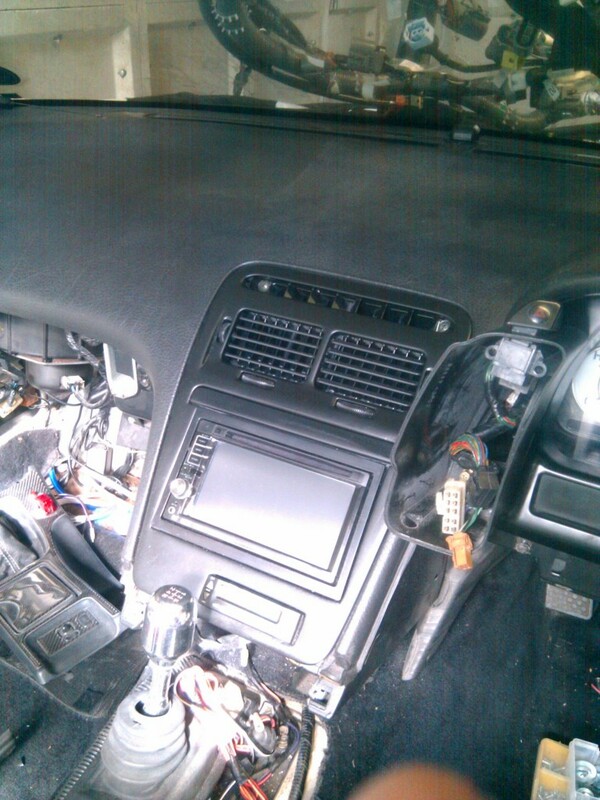 To get a flush fit you should fill right up to the edges of the bracket and go right to the edges of the centre console. This will give you a near perfect fit when you complete the sanding. 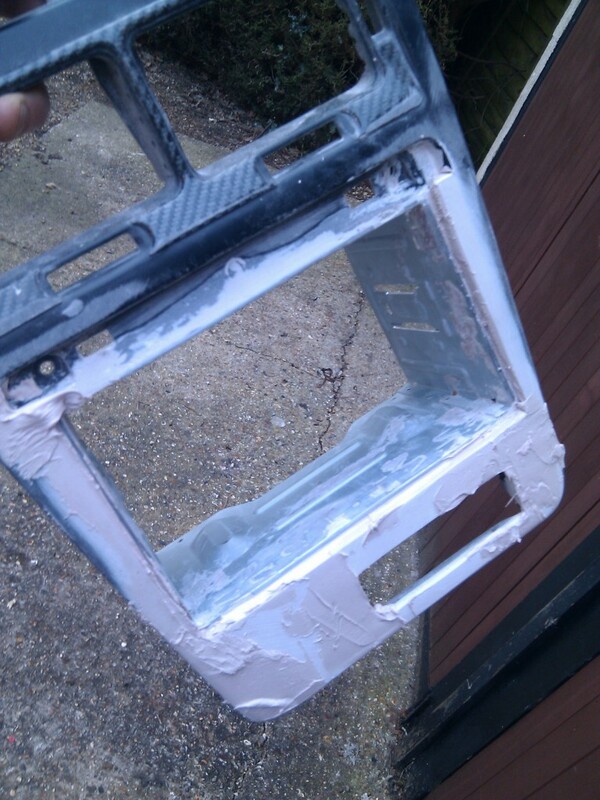 VERY VERY important make sure you gently pull it out before the filler goes hard and remove all the masking tape and excess filler from the plastic surround before it goes hard. 8. When the filler is dry you can now sand it using a block to make sure it is flat, dont do it by hand as it will distort the shape you want. Only sand the recess that the stereo face bracket made by hand, on the first fill it will look roughly right but you will undoubtadly need to fill it at least once more. Keep putting the front stereo into the recessed hole to check for a good snug fit, you want a hole of about 1mm the whole way around. After you have sanded it all you will be able to see any low spots as the block will not have been able to sand them. 9. You can now re fill any low spots as well as any of the recessed edging etc that needs more filler in it, once it is dry use 80 grit once agin to ensure all these are filled and the shape is good. Once you are happy with the shape use something like a 150 gri to go over all the work to remove some of the scratches and give a gental shape to all the edges and corners. When you have done this do the same thing with an 800 wet and dry to get all the scratches out of the fillerwork as well as the plastic facia. 10. 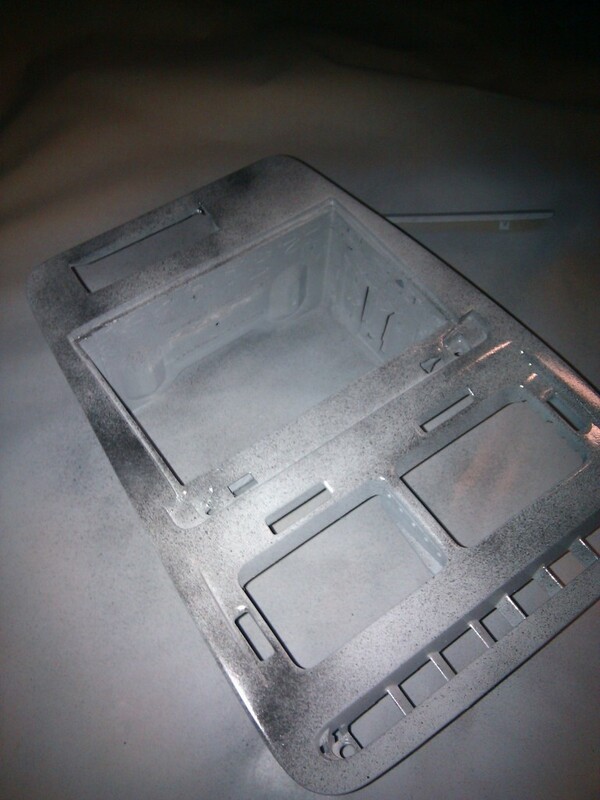 Now apply four coats of GREY primer if you want to spray it black, the high build filler primer tends to react with a lot of paints so try to avoid it and use the common grey stuff. Apply 4 good coats, one an hour, on the last coat spray a mist of black spray paint over the the top to use as a guide coat. The aim here is not to paint the thing black just to speckle a coat of black all over it to use as a guide coat. 11. When the primer is completely dry use some 1200 wet and dry and start removing the guide coat, you can do this by hand if you want to. 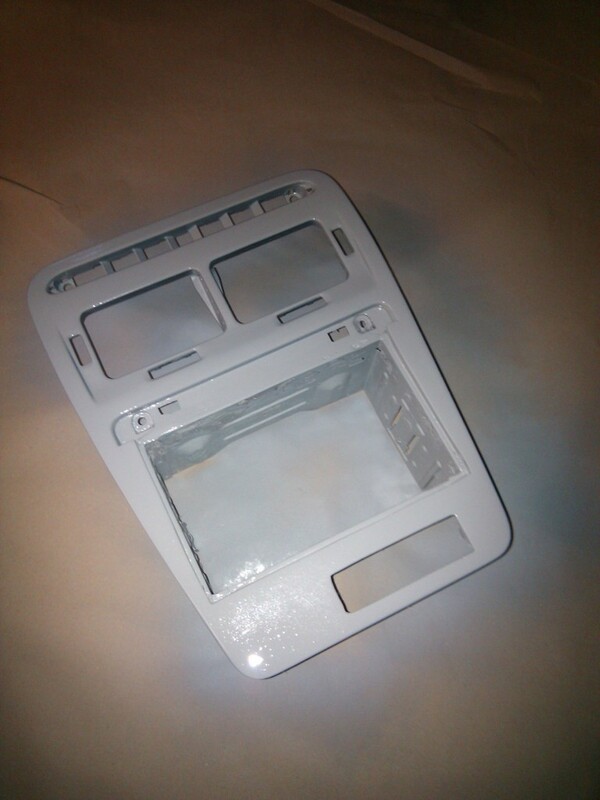 Basically it will show any scratches or imperfections and the aim here is to remove them by gently sanding the coats of primer back so they fill them. Try NOT to rub all the primer off as it will help give you a good finnish, some of the edges will rub back and that is fine. If you find that you need to rub a lot of it away to remove the imperfections then re apply and do step 10 and 11 again. 12. Now you can paint the facia in whatever colour you want, I choose matt black. It is very very important not to rush this and apply one good wet coat at a time then leave it to completely dry. I have used four coats on mine and done them over two days to make sure they were dry. 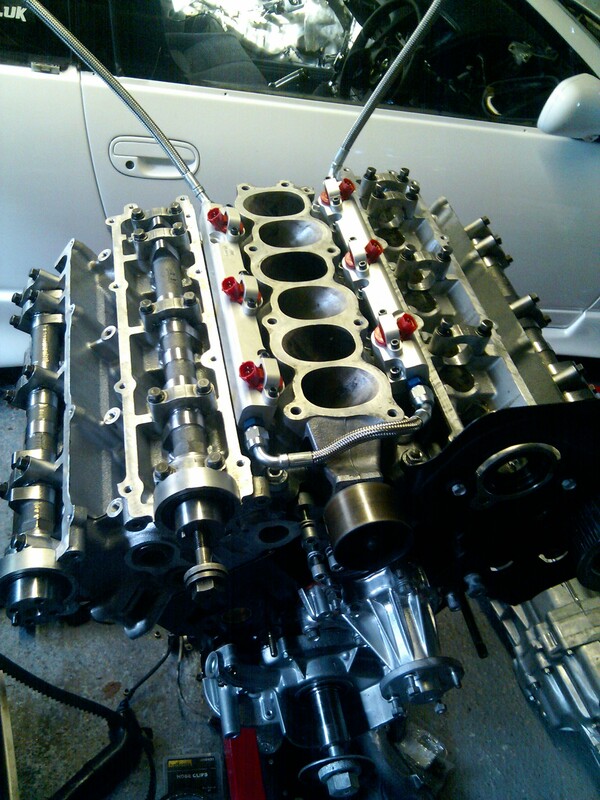 Once dr your facia is ready to be built back up again. You should hae a perfectly countersunk stereo surround and a flush fitting unit. I have made a another hole to fit my EDFC as well by using the same techniqes. Nice job on the double din. Would you be interested in producing another one and selling to me? I have a 1990 300zx. Please contact me by email. hey mate would you be able to make me one if i send mine down to you? 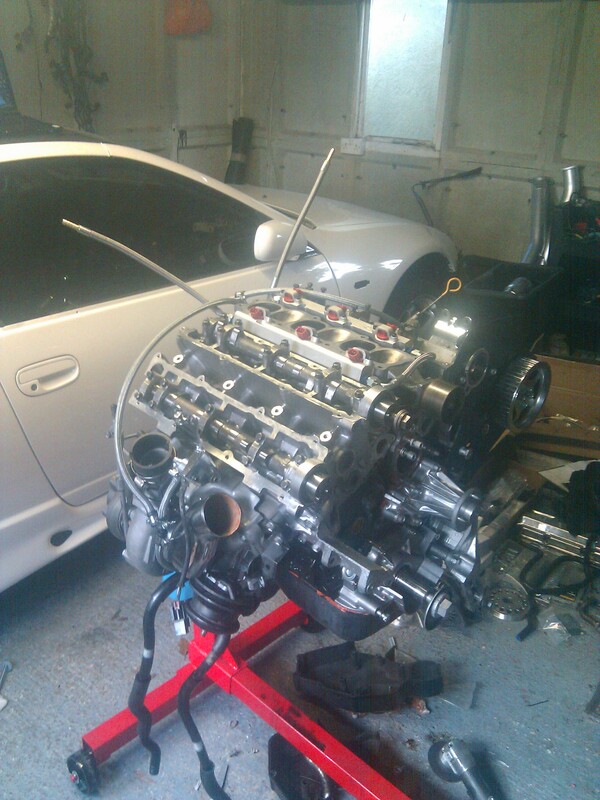 hey mate great job i agree with d. pope but i got a 1992 300zx and seeing if u would produce one and selling it? I think you have a knack for this !!! 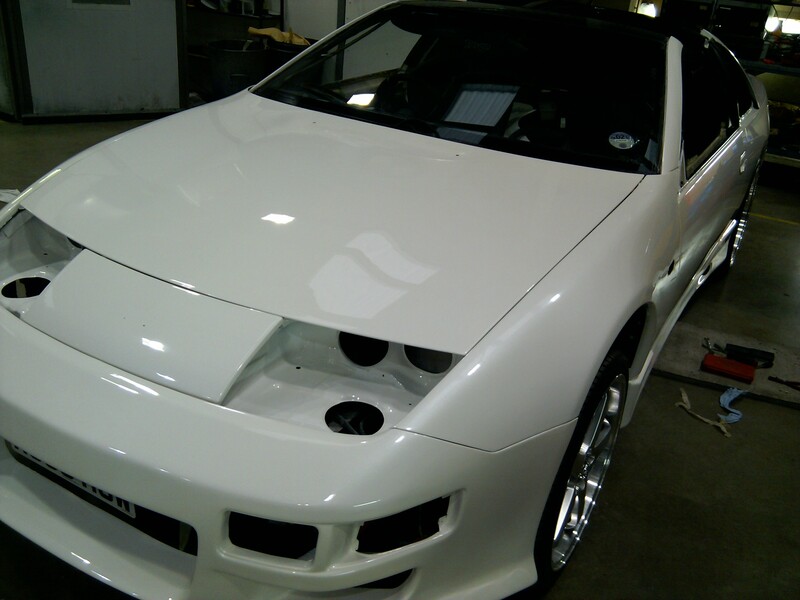 I agree with the other guy, I will be willing to pay if you had one made for me…1990 300zx. Great job!!! 5 stars *****!!! I would also be interested if you are taking orders. Looks fantastic. Right now I just have the seperator cut out and my screen in there. let me know! 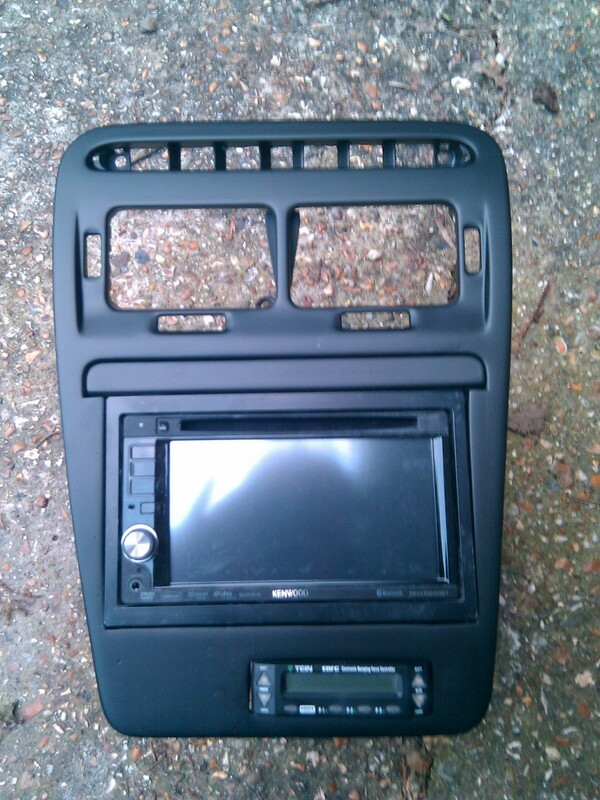 ive been trying to find a double din for so long, would you be willing to produce and sell me one? hey man same here if you can. 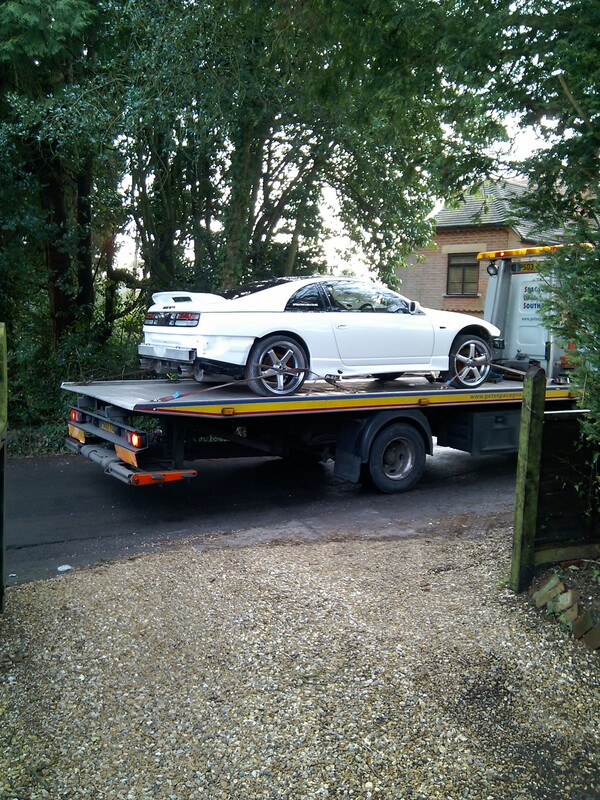 i have a 1990 nissan 300zx as well. please contact me through my email at your earliest possibility. Rays 7 Spoke Titanium Gram Light Wheels AWSOME!!!! 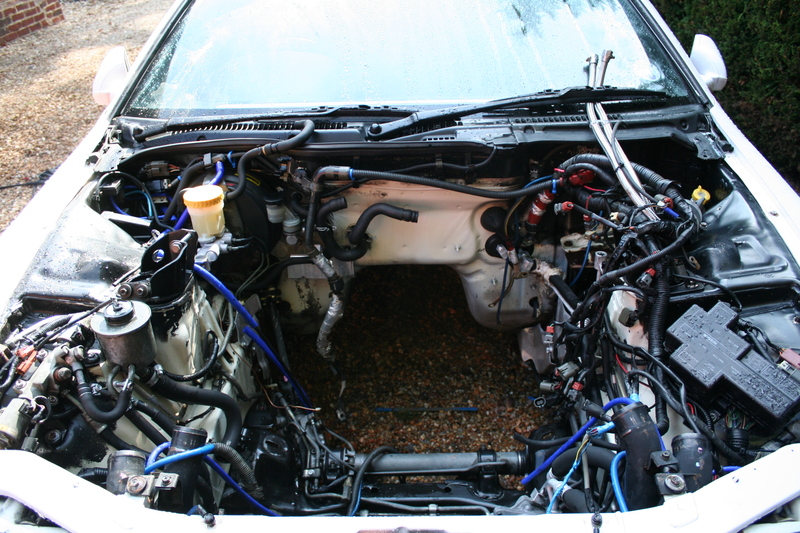 Engine and Gearbox in the car! © Copyright Project Nissan 300ZX Twin Turbo 2019. All rights reserved.